Union County has taken broad measures to support the inalienable right of every child: to play outside. The Union County Board of Chosen Freeholders announced the award of “”Level the Playing Field” grants to all 21 municipalities in the county. Level The Playing Field is a new grant program designed to help every municipality provide inclusive and accessible playgrounds to disabled children, as part of the Freeholder Chairman Sergio Granado’s 2018 Union County HEART initiative for community outreach and advocacy, according to a press release from the county. Letters to all 21 municipalities announcing the availability of Level the Playing Field funding were mailed last fall, and all 21 responded. “Every child should be able to enjoy a playground in or near their neighborhood, and participate in enriching sensory experiences with friends, family and neighbors from all walks of life,” said Chairman Granados, who launched Level the Playing Field in 2017 while serving as Vice Chairman. “We would like this program to become a statewide model for counties and local governments, showing how we can work together and help all families make healthy outdoor play a lifetime habit. 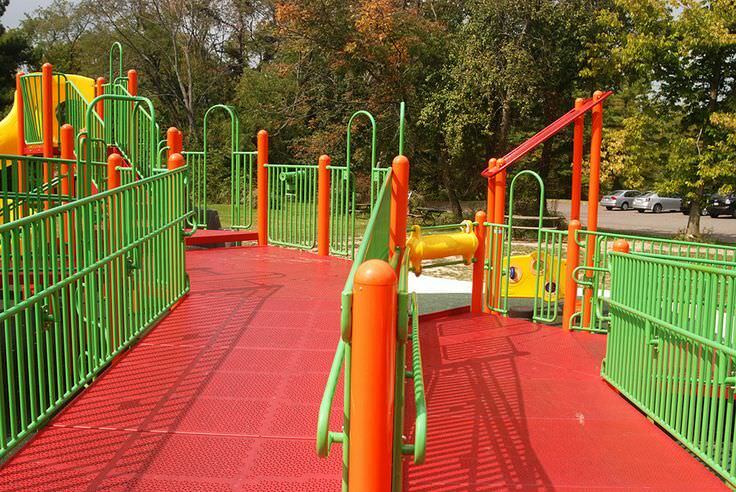 Before Level The Playing Field, Union County was still involved in making playgrounds more accessible to the disabled. In 2016, the county opened its first fully accessible playground, located in Mattano Park in Elizabeth. In addition the upgrading playgrounds, the County has worked on other projects and programs to benefit the disabled. Last fall, the Freeholder Board developed the county’s first inclusive Sensory Trail, a new .3 mile loop in the Watchung Rservation that includes a Braille trail with rope guides and nature-themed play structures, designed for people of all ages and abilities. Other Union County programs for people with disabilities include the Sensory Friendly Theatre series sponsored by the Freeholder Board at the Union County Performing Arts Center, and programs at the County’s Ulrich Swimming Pool, Watchung Stables and Trailside Nature and Science Center. The Freeholder Board also helps fund special programming such as annual fishing derbies, an ice skating social, summer carnival and barn dance, as well as programs for popular sports such as golf, yoga, volleyball, and karate. UC HEART stands for “Empowering, Advocating for, Reaching and Teaching others.” In addition to the new Level the Playing field grant program, UC HEART includes creation of the first Office for People with Special Needs in New Jersey. The new office is charged with improving recreational and social opportunities, reaching out to community groups and other stakeholders and identifying new opportunities for engaging people with special needs. More information about the Office for People with Special Needs is available on the County website, ucnj.org.